Perfect for the city streets & open spaces! Our Specialized mt. bikes will take you anywhere! Go the distance on our Specialized road bikes! Your Barcelona bike rental adventure begins with some of the sturdiest bikes in the business. They take place in a fun atmosphere founded on top-notch support and they finish with the feeling that you´ve experienced an amazing city on an equally amazing bike. Take a look below for everything you need to know about our Barcelona bike rental program. Sturdy, reliable, name-brand bikes make it easy to enjoy an afternoon pedaling the streets of Barcelona under the Mediterranean sun. 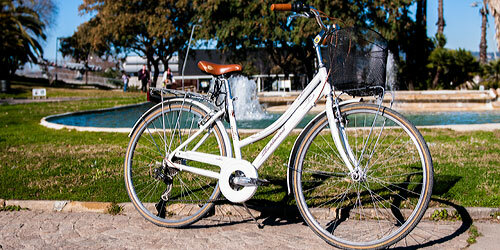 Read more about our fleet of Barcelona city bike rentals. Choose one of our city bike rentals. Our Specialized mountain bikes have the finesse and power to take you anywhere you want to go in Barcelona, from the waterfront to the hills behind the city and beyond. Read more about our Specialized mountain bike rentals. Specialized mountain bikes for off-road fun. Our Specialized road bike will allow you to go the distance in comfort and style. Read more about our Specialized road bike rentals. Fast & smooth, our Specialized road bikes will take you all the way. Choosing our bike transport services gives you all the benefits of bike delivery and pickup as well as our top-level customer support. Read more about our bike delivery/pickup and our support. Bikes delivered to your door. Everything you need to know about the details – big and small – of your rental with us. 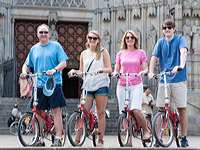 Visit our Barcelona bike rental terms & conditions.